Young people are increasingly being exposed to the huge and complex ethical dilemmas involved in issues such as genetic modification, animal rights and cloning, and they are bringing their views into the classroom. But how can teachers be sure they are sufficiently well-informed to help their pupils make sense of the diverse and emotive arguments surrounding these issues? * the use of animals in medical experiments. 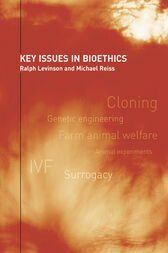 Written specifically for the non-specialist teacher or lecturer, this book offers suggestions on how to approach the teaching of bioethics and provides useful sources of further information. It may also be of interest to undergraduates on science courses.